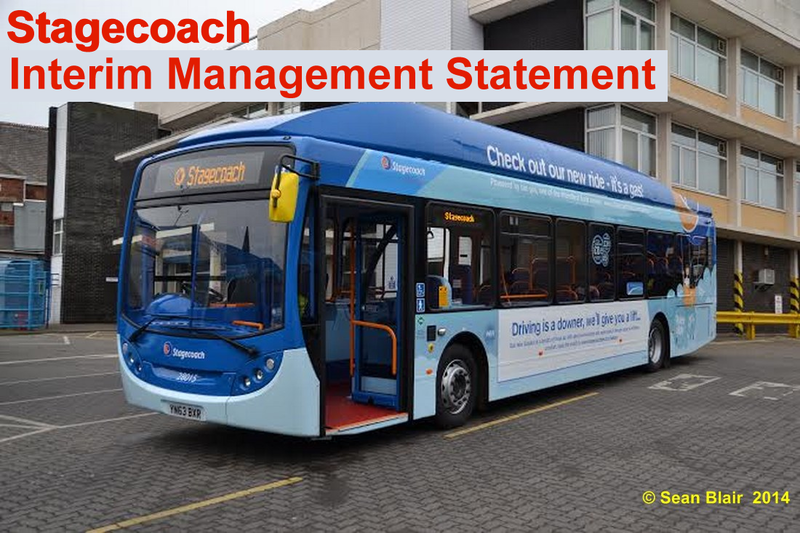 Stagecoach Group plc ("the Group") has published the following interim management statement, covering available information for the period to the date of this announcement. The overall profitability of the Group has remained satisfactory. There has been no significant change to our expected adjusted earnings per share for the year ending 30 April 2014, which given the effects of the severe weather in both the UK and North America, reflects the strength in the underlying trading of the business. Our UK Bus (regional operations) division has performed well during the period, with both passenger volumes and revenue growing year-on-year. Like-for-like passenger volume growth for the forty-week period was 1.2%. An increase in our commercial revenue has contributed most to the overall revenue growth, with concessionary, tendered and school revenue also continuing to grow. In December 2013, the Group completed the acquisition of Go West Travel Ltd, trading as Norfolk Green, an independent bus operator in the east of England. The effect of the acquisition on profit for the year ending 30 April 2014 is not material. Our UK Bus (London) division has performed strongly in the period, as we benefit from the new contracts won last year. From 1 October 2013, the business no longer receives Bus Service Operators' Grant (a rebate of fuel duty) but this is offset by a corresponding uplift in the contract prices paid to the business by Transport for London. Excluding this uplift in contract prices, revenue for the forty weeks has increased by 0.5%. As we expected the decline in revenue we saw in the first half of the financial year has reversed as new contracts come on stream. South West Trains' Alliance with Network Rail enables an integrated response to adverse weather conditions and provides the basis for the parties to work together to enhance the future resilience of the infrastructure. Recent extreme weather in the south- west of England has disrupted Alliance operations, presented significant challenges to customers and staff and had some adverse effect on the short-term financial performance of South West Trains. We anticipate that the effect of this on the results for the year will be largely offset by positive underlying trading in the UK Rail Division as a whole. We were pleased that in January 2014, the Department for Transport (DfT) confirmed that the Group together with its partner, Virgin Group, had been shortlisted to bid for the InterCity East Coast rail franchise. Work on our bid is progressing and we have revised our expectation of UK Rail operating profit for the year to 30 April 2014 to allow for up to £5m of current year bid costs in respect of that franchise. We continue to discuss with the DfT the planned extensions to our South West Trains and East Midlands Trains franchises and are making good progress with Network Rail in agreeing the terms for continuing the South West Trains-Network Rail Alliance. We also look forward to hearing the results of the Docklands Light Railway and Thameslink franchises. Despite the adverse weather conditions, trading in the North America division has been satisfactory. Megabus.com in North America is the fastest-growing part of the Group, increasing revenue by 20.3% in the nine months ended 31 January 2014. This reflects further growth in existing services, as well as contribution from our Texas and California networks launched during 2012/13. We recently announced the expansion of our megabus.com network to cover new locations in North and SouthCarolina, and have plans to add more services during 2014. Virgin Rail Group (VRG) continues to earn a fee equivalent to 1% of revenue from the West Coast rail franchise with the DfT taking the risk that revenue and/or costs differ from those expected. VRG and the DfT are discussing revised commercial terms that could see VRG take greater revenue and cost risk for the period from a date to be agreed through to April 2017 for a commensurate financial return. As previously reported, sightseeing revenue at our Twin America joint venture has reduced year-on-year in an increasingly competitive New York sightseeing market, that has seen Twin America's share of the hop-on, hop-off sightseeing bus tour market reduce. We continue to engage with the Department of Justice and other interested parties to seek a resolution to the current litigation involving Twin America. The Group maintains a strong financial position with investment grade credit ratings and appropriate headroom under its debt facilities. Consolidated net debt has, as expected, increased since 31 October 2013 reflecting the previously announced acquisition of Norfolk Green and continued investment in the Group's vehicle fleet. Overall current trading is satisfactory and given the broad geographical balance of the Group, its prospects remain positive.